This website has explored the subject of UFOs in-depth, with a particular emphasis on the most common interpretation of the phenomenon, known as the extra-terrestrial hypothesis (ETH), the view that UFOs represent alien spacecraft. It is only fair, therefore, that the contrary view, that UFOs cannot be alien spacecraft, is given an airing too. Where is the UFO Evidence? The key point raised over and over again by UFO sceptics is the lack of evidence that aliens are visiting us. Why have they not landed and made themselves known? There are a number of reasons, most of them darkly conspiratorial, why the aliens might not want to make themselves known. These are explored in an article elsewhere on the site and this argument on its own is less then compelling. But where are the photographs, the videos, the marks on the ground, say the sceptics? Well, actually, there have been a great many photographs, quite a few videos and even some mysterious marks left on the ground in cases such as the Livingston Incident or the Tully Saucer Nest, without even getting into the controversial subject of crop circles. But this isn't enough, say the sceptics. There should be more. Why are all the photographs unclear? Why are the videos always wobbly and out of focus? With all the camera-equipped mobile phones and camcorders in the world today, we should be positively swamped by crystal clear images of alien spaceships flying overhead, landing and taking off, according to their argument. This is debatable. There have, in fact, been photographs and videos of UFOs and they are not always unclear or wobbly. Of course, whenever evidence like this does appear, there are always arguments about its authenticity. Why are all Aliens Humanoids? Those who claim to have seen alien beings nearly always describe humanoid creatures of some sort. The aliens broadly resemble human beings. They have two eyes, a head with a mouth in it and usually some kind of nose; they have two arms and they walk upright on two legs. Does it not seem extraordinary that all of these extra-terrestrial creatures, at least some of which must have evolved on planets vastly different from our own, should nonetheless all closely resemble us? Surely there must be some planets where it would be have been an evolutionary advantage to have four eyes, or six eyes, or four arms? There is no reason why the humanoid form should be so pervasively dominant throughout the universe, say the sceptics. If aliens were real, we should expect to see insect-like aliens, dog-like aliens, flying aliens or fish-like aliens who evolved in a water environment, even jelly-like sludge based aliens or bizarre monstrosities the nature of which we couldn't possibly imagine. This is an interesting line of argument, without question. But the truth is we have no way of knowing what on what types of planet intelligent life may have developed. Perhaps intelligent life only does develop on broadly similar planets and the humanoid form really is the non plus ultra of galactic evolution. And reports of direct encounters with alien beings form only a small part of the sum total of UFO sightings. It's possible to be sceptical of the abduction and encounter stories while still believing in the phenomenon as a whole. Why do UFOs Need Lights? 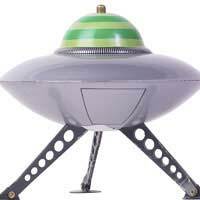 One argument raised against flying saucer reality relates to the lights seen on the alleged spacecraft. Our aircraft turn their lights on at night to help prevent collisions with other aircraft. Most aircraft are also equipped with more sophisticated avoidance measures, but, in the last resort, sighting the lights of an approaching aircraft can also be useful. Why would alien spaceships need them, though? First of all, they would presumably want to conceal their presence rather than advertise it, otherwise they would have landed on the lawn outside the Houses of Parliament by now. Second, if they have technology advanced enough to traverse the vast distances of space, surely they must have the means of avoiding collisions either with other spaceships or with our own relatively slow-moving aircraft without the need to resort to light displays? This is quite a powerful argument, it has to be admitted. The only reasonable responses to it might be that the lights may be made naturally by the equipment within the alien vessels, and they simply do not care enough about us to attempt to conceal it; that the aliens want to tantalise us with hints of their presence; or that the lights are caused my some malfunction within the alien ships. Of course, not all UFO sightings are at night, so even if this argument is accepted, it would cover only a fraction of all UFO sightings. When exploring an esoteric subject, it is always healthy to take sceptical arguments into account. Some provide interesting food for thought, but none seems unanswerable. No doubt the great UFO debate will go on. Has a human ever crashlanded? YES! It's perfectly plausible that aliens could crashland. a technically advanced race of beings able to travel between stars only to crash land on planet Earth, surely they must have come prepared with the correct landing gear?